I find lighthouses romantic, emitting radiant light to guide fishermen, sailors and ordinary beings, acting as lonely sentinels of the sea. On the tour with Ambeth Ocampo, we caught sight of this landmark dating back to 1642, the oldest in the Philippines and built by the Spaniards, on the north side of the entrance of Pasig River. Built using gray stone and standing fifteen meters in height, the original structure was demolished, sadly, in 1992 and replaced with the present one said to be architecturally inferior to the original. Note that the Parola also refers to the impoverished community in Tondo where the lighthouse is located. A Philippine Coast Guard station is nearby who maintains the place. Have you been to a lighthouse? I managed to also visit the solar-powered lighthouse in Capones Island in San Antonio, Zambales but missed Cape Bojeador in the Ilocos when I made the Ilocandia tour a few years back. A reason for me to re-visit that part of the world. I wonder how the famous, no longer extant, lighthouse of Alexandria, one of the Seven Wonders of the Ancient World, looked like. I like the first photo. Very, very nostalgic. may lighthouse sa olonggapo at camiguin na akong nakita. pero nakakainis meron pala maganda sa pasig na hanggang ngayon di ko pa nakikita, buti nalang pi-nost mo :) sana mabisita ko rin yan. malapit kila ferdz. Haven't heard of nor seen this. Interesting, Tito! There is also a lighthouse in Cape Bolinao, Pangasinan, my home province. Haven't been there though, hopefully this summer. Come to think of it, there are so many places which are only under our noses, but we take for granted, until we see them in photos - "Ay, ang ganda pala dito!" Eric, yup heard of this one before but only now that I've seen it with my own eyes. lino, opposite the ghetto of Baseco at the mouth of the Pasig river from Manila Bay. 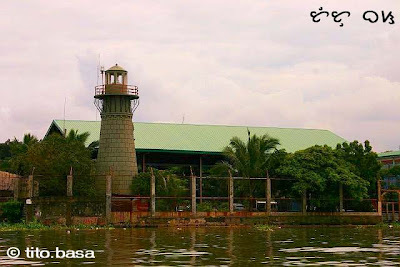 There's another old, historic lighthouse at the other end of Pasig River connecting to Laguna de Bay. Will try to locate it. Heard it's in Napindan, Taguig. i find it eccentric to see lighthouses as romantic. i have to see one maybe. for me, these structures depict melancholy. it feels so alone. Is the cruise available for everybody else? I guess not, pero sana pwede. viewing lighthouses as such is just another facet of my eccentricity. I prefer the old style of lighthouses with fire and not solar-powered ones but they can only be seen in the movies nowadays. the cruise was only held twice and no follow-up event by the Ayala Museum. I heard though that it's the Pasig River Rehabilitation Commission who's holding this event regularly under the radar of most of us. If ever there are people out there who are interested about lighthouses in the country you may want to get hold of the book "Lonely Sentinels of the Sea: the Spanish Colonial Lighthouses in the Philippines" it documents 23 lighthouses around the country. There is also an exhibit pertaining to this which is touring various schools and institutions around Manila. If anyone is interested in having this exhibit too, let me know. yes, i once saw your book at Fullybooked in Cubao once and scanned the pages. been to Capo Bojeador and it's great. Mang Vic, the Lighthouse keeper tells me that the structure is the same with the one in Capo Merville, the southwesternmost lighthouse (Palawan). Capo Engaño is already dilapidated but im glad i visited it when i was a kid (12 years ago) i had pictures pa. hehehe. Paetechie, how's the quest for el Parola de Napindan going? there is this book: ANGELS an STONES. It documents the building of Capo Bojeador since its was the Agustinian Friars who "built" it. The book is present in Agustinian school libraries (CSA makati). Again, Manong Vic (Junior) introduced the book to me. planning to visit Calatagan and Bolinao lighthouses someday. The Napindan one I will try to visit once the Pasig River Ferry station in Napindan, Taguig is finished. Is this place open to the public? Can it be rented out for a photography demo? you can tag along if u want :)anyway would you know where's this lighthouse located exactly and how to go there. i've been trying to figure it out. drop me a message at my site if you can. 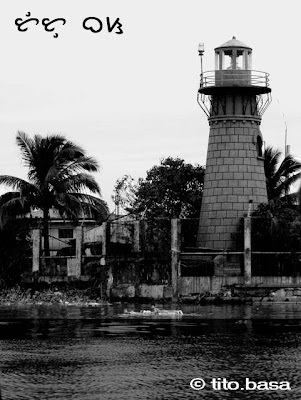 I'm not familiar with the location of that Pasig river lighthouse. But I want to see it and take some photos on it. This is to compile the old Pasig River into latest images of the said river. Lighthouses are among the places that are meaningful to visit. It feels like they have so many stories of long ago to tell. Just like Bingskee, for me their sight feels so melancholic.... Thanks for this post. I'm from Taguig and currently I am finding ways on how to locate the Napindan Lighthouse, that's why I stumbled upon your post. It should not be far from where I live because we're in the same town - Tipas, Taguig City. I hope to see it this month and feature it in an article.